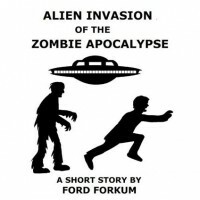 I had a good laugh while reading this hilarious account of what a Zombie Apocalypse would look like if mixed up with aliens and vampires. As a lover of irony and subtle sarcasm, I have really enjoyed this story of these very intelligent aliens who decide to invade Earth just because they are bored. The way they chose which planet to invade was very funny too (but I won't say it here, I don't like spoilers). So, what do you think that aliens, zombies, vampires, and college students have in common? Not a clue. Read this short story and you will discover it. My only problem with this story was that it feels too short; I mean, it really has a lot of potential to be turned into a novella, and I would have loved to see that. But it is a very recommendable story to read if you want to have a good chuckle.